Every parent knows that establishing good, consistent brushing habits in kids early in life sets them up for a life of strong dental health. However, it can sometimes be challenging to get those little ones to brush consistently, twice a day, every day, using proper techniques. Luckily, there are lots of resources to make brushing fun, including tooth brushing songs and videos. Check out a few of them below! The Sesame Street gang enlist a few famous friends to get the word out about brushing. Check it out: https://www.youtube.com/watch?v=wxMrtK-kYnE. Colgate Brushing Games – Colgate has actually built a library with tooth brushing games that are broken down by age: ages 2-4, 4-6, and 7-8. The games have lots of options and are easy to play while getting the point across to brush every day! Sesame Street – Healthy Teeth, Healthy Me – These tips and tools were designed to help you and your child care for her teeth together. Lots of fun to play! To Tell the Tooth – it’s a trivia game about good dental health! Set up like a game show, it’s lots of fun and very engaging for kids. Books About Dentists and Teeth – there are lots of great books about going to the dentist and tooth brushing. This site has a great collection to check out! Need more ideas on how to make brushing fun for kids? 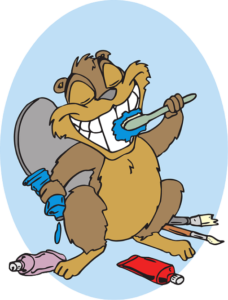 Many pediatric dentists have flyers, tips or a kid’s iBrush Club to get children to brush their teeth. Ask your pediatric dentist what they have in their office to encourage kids to brush. The foundation for healthy teeth in kids is established during the first years of their life. Poor tooth brushing habits during those early years have been shown to be related to tooth decay in children and leads to poor dental health as adults. It’s important for parents to help children establish good habits early. These games, songs and videos could help make the process easier and more fun for both kids and adults!